Don't look now, because her hideousness is back and she's meaner and uglier then ever. This time Rita Repulsa is out to pulverize the Power Rangers once and for all and she's brought all of her nasty friends along to do the dirty work. But, Jason, Trini,Billy, Kimberly, and Zack are at their morphing best with the awesome of the Super Nes machine on their side. Incredible graphics, amazing sound, and unbeatable action make this battle of good and evil an instant SNES classic. The game features seven challenging levels of play ending with breathtaking, all-out battles against Rita's most fearsome henchmen including Bones, Eye Guy, and many more! Only the power of the Super Nes can put all of the characters and excitement of the phenomenal hit TV show right at your fingertips. So what are you waiting for? 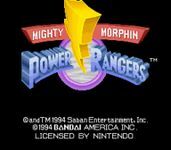 Morph in to action now with the Mighty Morphin Power Rangers.